— Using a survey experiment and utilizing a technique known as “emotional recall,” I find that individuals asked to write about a time they were very angry or to write about a time they were very angry about politics were more likely to agree that the national government is unresponsive to the concerns and interests of the public. Merely asking individuals to recall a time they had thought about politics had no effect on lowering trust in government. These results indicate that anger does play a causal role in lowering citizens’ trust in the government. — A regression analysis of respondents’ use of angry words as well as positive and negative emotional words revealed that those who were primed to exhibit higher levels of apolitical anger offered the most negative views of the national government. That is, apolitical issues, rather than political issues, elicited the most anger. This suggests that the magnitude of the anger, and not necessarily the target, is the most important factor in shaping citizens’ trust in government. — Normatively, these results have troubling implications. With the rise of negative partisanship and a contentious style of governing, Americans are more frequently exposed to anger-inducing stimuli. With politics increasingly defined by feelings of anger toward the opposing party and its governing elite, trust in government is bound to decline. From President Donald Trump’s tweets, to congressional gridlock, investigations about Russia’s potential meddling in the 2016 presidential election, and, yes, a comedian’s standup routine at the White House Correspondents’ Dinner, the political scene is inherently anger-inducing. Indeed, in an era defined by intense partisan divisions where the logic of negative partisanship governs most political decision-making and forms of political behavior, anger is an omnipresent emotion in contemporary American politics. Yet, despite the fact that anger is so prevalent within the American electorate, little work has been done to understand the ways in which this anger is related to an equally worrisome trend that has been developing simultaneously: Americans’ declining trust in their own government. Trust in government has declined precipitously over the past 60 years. As the trend line in Figure 1 shows, high levels of trust in the national government were typical in the latter years of the Eisenhower Administration. However, by 2016, only 20% of Americans said they trusted the government “always” or “most of the time.” Because trust in government is essential for facilitating democratic representation and legitimacy, understanding the causes of this cratering trust in government is of paramount importance. My research, published last September in the journal Political Behavior, suggests that the growth in anger within the electorate and Americans’ declining trust in the national government are not separate phenomena. In fact, my work has shown that higher levels of anger within the electorate are actually one of the primary reasons citizens have lost trust in the national government. Why might we expect higher levels of anger to lower citizens’ trust in the national government? The primary reason stems from the psychological theory of “mood congruity.” Aptly named, this theory argues that people tend to evaluate institutions, objects, or other people in ways that are in line with the emotions that they feel. Moreover, psychological studies indicate that every emotion has either a positive or a negative valence to it. So, if one is experiencing the emotion of happiness, he or she will evaluate objects positively precisely because happiness is an emotion with a positive valence. On the other hand, because anger is an emotion that contains a negative valence, an individual who is in an angry state will tend to render negative evaluations of any given thing. To examine whether and how anger within the electorate causes citizens to lose trust in their own government, I conducted a survey experiment on approximately 3,300 registered American voters a few months before the 2016 presidential election. The key part of the survey is the experimental manipulation that seeks to induce anger in respondents. To do this, I utilized a technique known as “emotional recall.” This strategy simply asks respondents to write a paragraph about a time they were very angry about politics. The idea, which is rooted in psychological studies, is that when individuals write about an anger-inducing experience they will temporarily relive that emotional response. However, in addition to asking respondents to write about a time they were very angry about politics, I randomly assigned respondents to two other treatment groups: a group that asked individuals to write about a time they were very angry, and a “political salience” group that asked individuals to write about a time they thought about politics. By doing this, I am able to separate the emotion (anger) from the target (politics) while invoking anger. Separating anger from politics is important from a theoretical standpoint because this allows me to examine both the effect of political anger and generalized apolitical anger on citizens’ trust in government. The individuals randomized into the control group were asked to write about what they ate for breakfast. This serves as a useful control group because it is benign in nature and unrelated to politics or political affairs. The schematic displayed in Figure 2 illustrates these four randomization groups. To help facilitate an easier understanding of these experimental conditions, consider the following examples of responses to each of the treatment groups. One individual who was randomized into the anger about politics condition wrote that “the lack of action on social security pisses me off — it seems congress always waits till the very last minute to fix issues with it that need fixing.” Another individual wrote that “[o]ur country is going to crap because politicians care more about themselves and their own personal agendas then [sic] they do the welfare of the country and its people.” Individuals who were randomized into the apolitical anger condition wrote about their divorce, problems their children were having at school, and confrontations with former romantic partners. Finally, those individuals who were randomized into the political salience condition tended to write about noteworthy political events from their formative years, such as the assassination of Robert Kennedy. After the randomization process was complete, survey respondents were asked to rate their level of agreement with the following statement on a 0-10 scale, where higher values indicate more agreement: “The national government is unresponsive to the concerns and interests of the public.” Accordingly, higher values on this measure indicate a greater level of distrust in the national government. The results of the experimental manipulation are shown in Table 1. 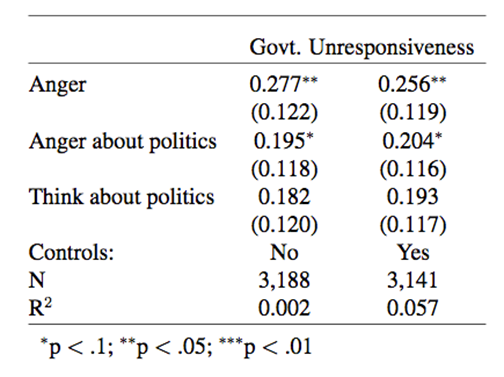 The positive coefficients for the “Anger” condition and the “Anger about politics” condition indicate that individuals who were randomized into the treatment groups that asked them to write about a time they were very angry and to write about a time they were very angry about politics, respectively, were more likely to agree that the national government is unresponsive to the concerns and interests of the public. Merely asking individuals to recall a time they had thought about politics had no effect on lowering trust in government. These results indicate that anger does play a causal role in lowering citizens’ trust in the government. Yet, the results shown in Table 1 raise as many questions as they answer. Indeed, a particularly curious result that emerges from Table 1 is the fact that those individuals who were primed to exhibit higher degrees of apolitical anger gave more negative evaluations of the government than those who were primed to exhibit higher levels of anger specifically about politics. Because the national government is a political institution, the most logical expectation would have been to expect bigger effects for those who were given the political anger treatment. To determine why the treatment effects were the largest for the anger-only condition, I conducted a sentiment analysis on the text that individuals wrote during the experimental design. To do this, I utilized a lexicon known as the Linguistic Inquiry and Word Count (LIWC). In addition to analyzing the grammatical structure of a text, such as the number of adverbs or pronouns used, the LIWC dictionary is able to classify the emotional content of a given text. For these purposes, I was interested in the percentage of words each individual used that the LIWC dictionary classifies as “angry words” (there are nearly 200 words classified as angry words; examples include “frustrated,” “annoyed,” “irritated,” “hate,” etc.) and how this varies by treatment status. To do this, I conducted a regression analysis where the primary dependent variable is the percentage of angry words used in the respondent’s text and the independent variables are dummy variables indicating which treatment status the respondent was randomized into. I also analyzed the percentage of “negative emotional” words (an aggregate scale of all negatively-valenced words) and “positive emotional” words (an aggregate scale of all positively-valenced words) each respondent used. The results of these regressions are shown in Table 2. The results of the regressions shown in Table 2 indicate that those who were randomized into the anger only condition used nearly 3.4% more angry words, 4.5% more negative emotional words, and 3.4% fewer positive emotional words than those who were in the control group. Those who were randomized into the anger about politics treatment group used 2.7% more angry words, 3.7% more negative emotional words, and 2.4% fewer positive emotional words than the control group. These patterns reveal why those who were primed to exhibit higher levels of apolitical anger offered the most negative views of the national government: apolitical issues, rather than political issues, elicited the most anger. This suggests that the magnitude of the anger, and not necessarily the target, is the most important factor in shaping citizens’ trust in government. Finally, the results in Table 2 reveal something disconcerting: those who were asked to write about a time they had thought about politics were also more likely than those in the control group to use angry words and negative emotional words. This suggests that, to some extent, anger and politics are not separable. On the contrary, in the contemporary era, politics and anger go hand-in-hand. Normatively, these results have troubling implications. With the rise of negative partisanship and a contentious style of governing, Americans are more frequently exposed to anger-inducing stimuli. With politics increasingly defined by feelings of anger toward the opposing party and its governing elite, trust in government is bound to decline. Absent some drastic change to the political system that reverses this trend, it is possible that trust in government will decline to a level so low that the national government will lose its sense of legitimacy in the eyes of those to whom it is accountable. To the extent that trust in government is a sign of the health of American democracy, we have ample reason to be concerned. My full study can be found here. Steven Webster holds a Ph.D. in political science from Emory University. His research interests involve political psychology, voter behavior, and public opinion.